Chevy Kovaly-Long is feeling fine about things. This may be a great way to advertise an Aussie-themed steakhouse, but it’s a bad practice with your dog. If there are no clearly communicated boundaries, dogs—like children—will test their environment to determine what is safe or dangerous and what offers rewards or punishments. Problems don’t arise because our hounds have decided to storm the castle. Problems arise when they have no sense of structure or boundaries, when they can’t understand what we are trying to communicate, or when their relationship with us isn’t as strong as it should be. Simply put, your hound has to understand what is expected of him and to trust you with his life. Don’t worry about who goes down the stairs first as long as he’ll wait at the top if you say wait. You don’t need to turn your home into a mini-bootcamp. I spoil my dogs rotten. They sleep on the beds and furniture. I share my food with them. My dogs have earned those privileges. Once your dogs have learned your house rules, you can cheat with most dogs and give them goodies occasionally just because they’re so cute. We don’t need a lot of pack ranking exercises or phony alpha displays to communicate with our dogs. You don’t have to be harsh to be in charge. And scruff shakes and alpha rolls don’t make you a leader. They make you a bully. If you have to use force to get your way, you have no real power. I train without a leash or a collar except as necessary for my dogs’ safety. My hands never touch my dogs when we’re training except to pet, praise, or protect them. So how do you develop this kind of relationship with your hounds? A dog that isn’t looking at you usually isn’t listening to you. A dog that pays attention only when you have food needs to be reminded that you own the can opener. Before you do anything else, teach him to look at you or to you for everything he wants. Teach him to sit (or down) and pay attention to you no matter what is happening around him. This behavior becomes the doggie equivalent of please. It is the only way to get what he wants. If you expect a toddler to say please, you should certainly expect the same from your hound. Teach him to work for a living. There are no free lunches. Give him a job and a sense of purpose. It doesn’t matter what behaviors you pick as long as all goodies (petting, walks, food, treats, etc.) are earned and you control his access to them—or at least have him think you do. Teach your hound the way Grandma taught you. To get dessert, you had to eat your veggies. If he isn’t sitting and paying attention to you the door doesn’t open, the leash isn’t put on, or the treat goes back in the cookie jar until he complies. Find activities that work his brain as well as his body. Bored or under-worked dogs are far more likely to look for things to get into. If he has a job of his own he has no need to go looking for one. Teach self-control exercises like attention, stay, and an immediate recall. These exercises aren’t about obedience. They are about safety, self-confidence, communications, and relationship. The better he knows them the calmer he will be in all situations and the more he will trust you and look to you for guidance. And it takes only a few minutes a day of formal training. If he becomes ill or injured, how well he accepts handling can be critical. Help him learn that being handled and touched on any part of his body is pleasant or at least acceptable. Each Greyhound is different. Some never test the rules. A few are always testing. How do you know if your hound needs a more structured environment? Try this easy test. How many sentences can you begin with “my dog won’t let me…(move him from the bed, take a favorite toy, trim nails, etc. ),”or “my dog won’t…(sit when I ask him, come when I call, etc. )?” The more sentences you can complete, the more your hound needs a stronger sense of structure and leadership. Find a good trainer or behavioral consultant who uses gentle, positive methods and get to work. CG W 01 ALL RIGHTS RESERVED This article and any photos or artwork contained within may not be reproduced or reprinted without express written permission from the author, artists, and/or photographers. Author Bio – Lee Livingood is the author of the critically acclaimed, Maxwell award winning book, Retired Racing Greyhounds for Dummies. 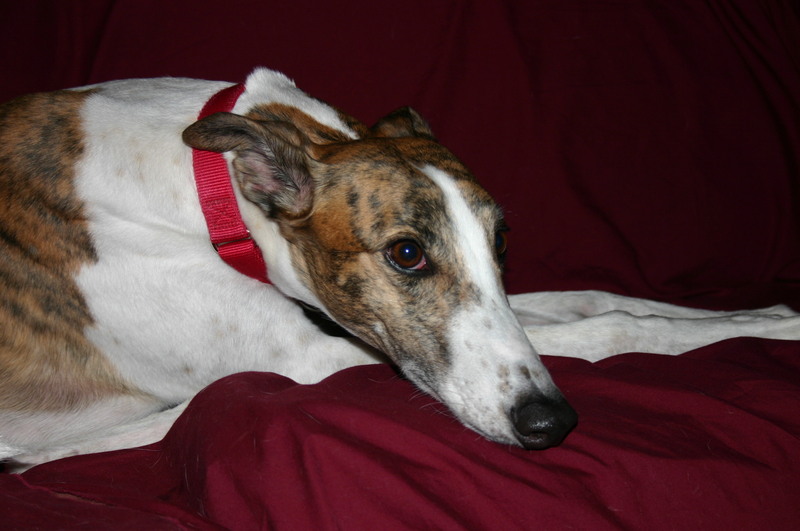 It is viewed by many adoption groups as the “Bible” for Greyhound adopters. Lee is a certified dog behavior consultant in Harrisburg, Pennsylvania and is a member of the International Association of Animal Behavior Consultants. She has been helping adoption groups and adopters with training and behavior advice since 1996 and wrote a regular column for CG Magazine called “Tales From the Couch”, some that are reprinted here with Lee’s permission.